This great Retro 50's design holiday card definitely catches the eye. Imagine how it will stand out on the mantles and tables of your friends and family. (NOT your standard snowy tree scene.) 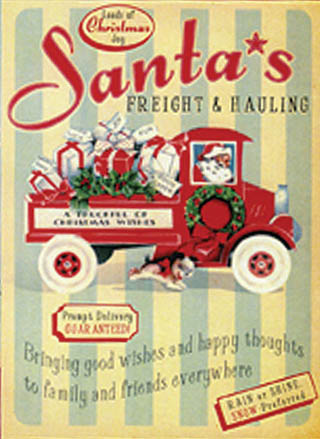 Santa's Freight and Hauling brings good wishes and fun gifts to "Have a Merry Christmas." The box of 10 cards (5" X 7") has envelopes.